This concentrated blend of live liquid bacteria and enzymes activate drain lines and grease traps while providing instant odor control. Exceptionally effective in controlling odors in garbage collection containers, porta-toilets, restrooms and other problems areas. In addition to its bioactive agents, this product contains a high concentration of grease solubilizers insuring superior performance by allowing faster penetration and liquefaction of waste materials. 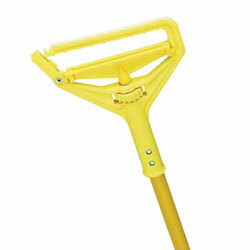 PRO-LINK® Standard Cut End Wet Mop - 24 oz.